As of 2016, more people actively use messaging bots than social networks. This represents a massive opportunity for marketers to reach people where they are. So it’s no big surprise that Facebook recently opened up its API to allow brands to create an owned presence on Messenger. 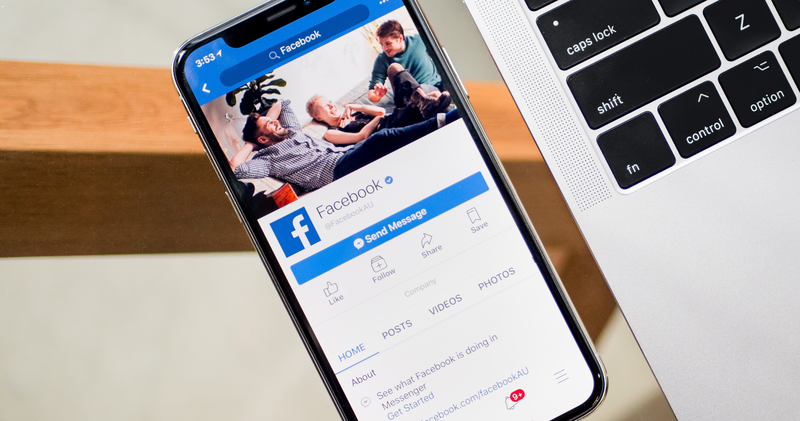 While most brands initially used it as a customer service channel, businesses are increasingly expanding what they do on Messenger: broadcasting content, driving conversions, and engaging 1:1 with potential customers. To leverage Messenger in such ways, brands generally rely on Messenger bots. And with the emergence of tools like ManyChat, creating a Messenger bot has become a democratized process that doesn’t require knowledge of programming or artificial intelligence. Any brand can use ManyChat to create simple bots that capture email addresses, drive traffic to their websites, and create entirely new value propositions that take advantage of Messenger’s 1:1 nature. Today, we want to take the conversation one step further and talk about growth. Because if you create a bot but not an audience, you’re only going to be talking to yourself—and you’ll be missing a massive opportunity. When you invest in growing your Facebook Messenger audience, you’re not only building a following on a new channel, but also a creating a powerful data collection tool. You can use Messenger to collect data like email addresses, phone numbers, or any other points that align with your audience development goals. Unlike with “walled garden” channels like Snapchat or Instagram (where content is pretty self-contained), you can set up Messenger campaigns to accomplish a massive variety of tasks. ManyChat offers a suite of growth tools to help expand your brand’s Messenger audience: everything from website popups, landing pages, embeddable widgets, and integrations with Facebook ads. Our first round of test campaigns indicate that new Messenger subscribers can be acquired for between $0.30 and $1.00. According to HubSpot, “[our] Facebook Messenger broadcasts had an average open rate of 80% and average CTR of 13%. That was 242% and 609% better than our email controls, respectively.” BlueWing has seen similar (if not higher) open and click-through rates across the bots we have created. Given the myriad uses of Messenger, you might be wondering what this looks like in practice. Let's use City Plantz, a side project we're working on, as an example. City Plantz launched at the beginning of 2018 as a new resource for indoor gardeners. The mission of City Plantz is to help city dwellers successfully take care of their houseplants, and has already manifested itself as a book, blog, Instagram account, newsletter and now as a Facebook Messenger bot. And while the mission is consistent across the board, we take advantage of each channel’s nuances to create a unique experience. The City Plantz Facebook Messenger bot has a simple value proposition: quick, personal advice delivered in a 1:1 fashion. Any user can ping us on Messenger with a question about indoor gardening and get an expert response in return. And along the way, we're using Facebook Messenger to grow our email list and drive traffic back to our website. Here's how we did it. First, we set up a ManyChat account and scripted out how our bot would interact with new users. Then, to incentivize new users to message us, we launched a giveaway. Once users messaged our bot, we’d ask them for their email in order to qualify for the giveaway prize. Almost all new Messenger subscribers provided us with their email addresses, which we synced from ManyChat to Mailchimp through a Zapier integration. Email collection accomplished! Next, we turned to Facebook Ad Manager to set up a campaign to promote the City Plantz bot, taking advantage of a new Facebook campaign objective option: driving new messages. As we mentioned above, we've seen Messenger subscription rates vary between $0.30 and $1.00 so far within our campaign. Because you're advertising Messenger on Facebook, the user barely has to leave their feed to engage with the call to action. We knew that we needed to be strategic about engaging the new audience we were creating via Messenger. So we decided to create an automated sequence (using ManyChat) that would send new subscribers a steady drip of content, one new piece each week. City Plantz content is very evergreen (ha), so we plan on extending our automated sequence as far as we can (see below) to continue driving free traffic forever. 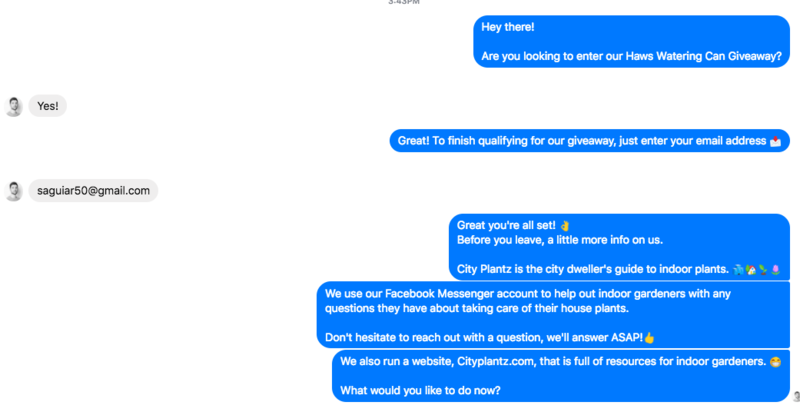 Hopefully the City Plantz success story has helped illuminate the power of Facebook Messenger to grow your audience across channels. In a few short weeks, we've generated hundreds of Facebook Messenger and newsletter subscribers through this strategy, increased traffic to new blog content on an automated basis, and answered dozens 1:1 questions about indoor gardening. As we look to monetize our growing audience of gardeners, we plan to use Facebook Messenger as a way to test what our audience is looking for from City Plantz next.